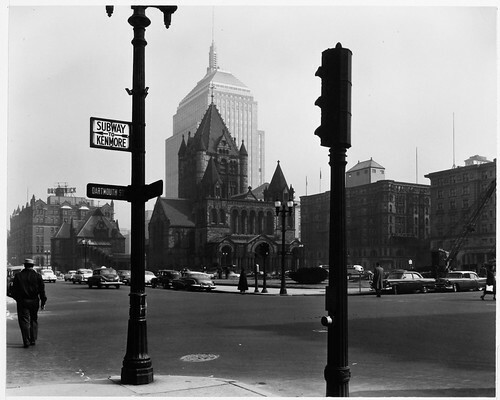 50 ft. Intervals, Corner of Boylston and Dartmouth Streets, Looking Across Street to Trinity Church and Copley Square, a photo by MIT-Libraries on Flickr. Youth, athleticism, joy, freedom; the thrill of running and competing, a multi-ethnic spectacle participated in by all ages, by men and women, going by, past the great buildings of old Boston, the Trinity Church and the Old South Church and the magnificent front of McKim, Mead and White’s BPL; down Boylston Street, hearts beating, blood pumping, legs moving; eyes, hearts, brains in the tens of thousands, taking it all in, the wonderment of urbanity and the ancient tradition of the marathon, transported to modernity, in the Athens of America. And then death and dismemberment in a garbage can. Smoke and darkness, blood and limbs, broken glass and fallen people and screams of horror. In tears, with heavy hearts, we mourn this senseless act of violence.